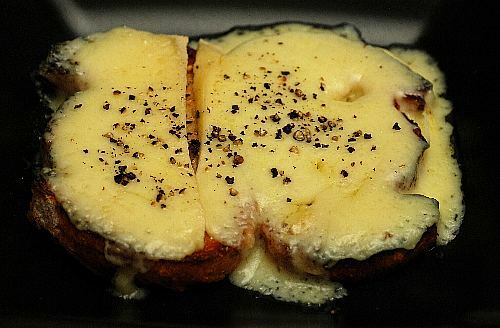 One of the simplest and most popular Swiss recipes is the croûte au fromage, a hearty celebration of melted Alpine cheese over toasted bread with a hint of garlic and a generous amount of fruit brandy. Delicious and foolproof if you follow my instructions. Here is how I bought the cheese used in this recipe directly from a small cheese-making chalet in the Swiss Alps - 2 hours' walk from where roads stop. We have mountains in Switzerland - lots of them. 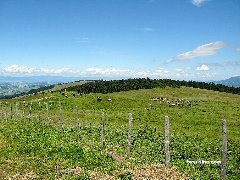 Some are tall and spikey like the Matterhorn, but others are low (2000m/6000') and referred to as montagnes à vaches 'cow mountains', because they are turned into pastures for cows during the summertime. And this is where us glutoons start to pay attention, for the very best Swiss cheese is born on these lowly cow-mountains despised by the summit-climbing jocks. Any Swiss worth his cheese knows that good cheese comes from good milk. You cannot get good milk unless your cows eat a well-diversified diet of fresh plants. Cows in the plain eat hay and industrial animal food. No surprise, when this garbage is processed through the cows' intestines, the resulting milk does not have an impressive taste. 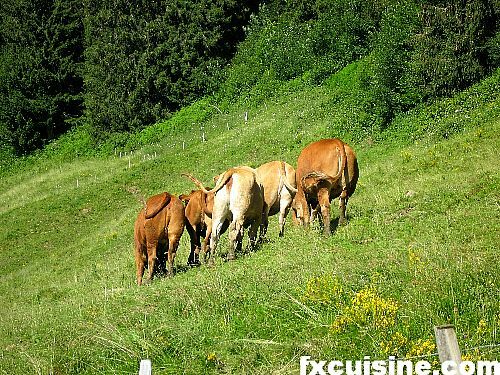 But cows who pasture on alpine meadows - known as alpages - enjoy a diet of the freshest flowers, herbs and grasses. 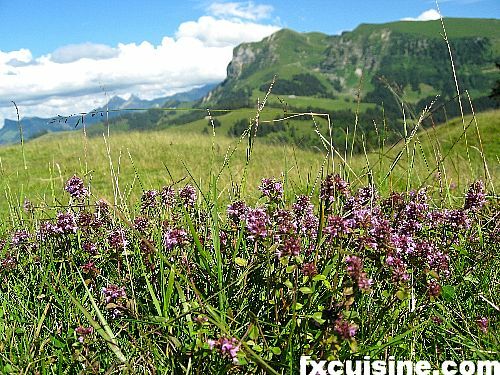 Last week-end I drove up Les Alpettes cow-mountain where the Gruyère county meets Lake Geneva and measured the amazing diversity of the plants growing there. Bunches of wild thyme in full flower made for pinkish patches here and there (picture above). We left the car where the road stops and after two hours' walk we reached a huge meadow with a tiny chalet d'alpage in the middle. As we drew near, we met the creatures whose milk was turned into cheese inside the chalet. Tiny white goats and the trademark Gruyère cow, with black and white patches like if you had spilled a gallon of ink on their backs. 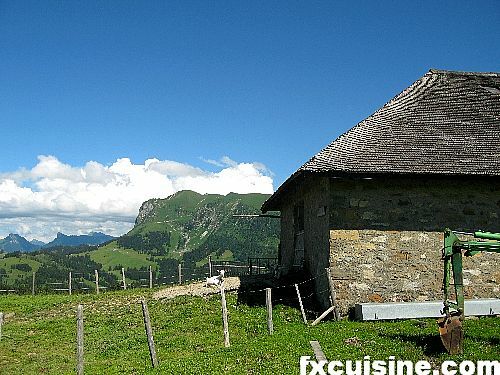 The chalet d'alpage (Alpine pasture chalet) was clearly active and I drew near. This chalet is the real thing, well outside of the beaten track, apart from a few hikers and the occasional mountain biker, few tourists ever set foot up there. 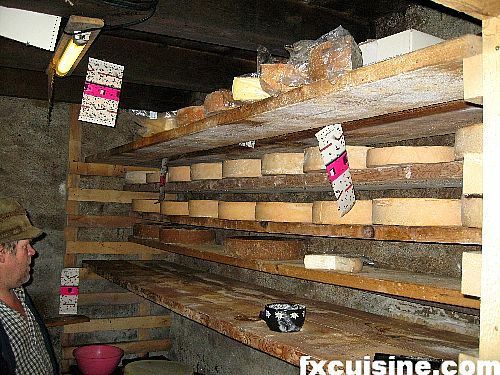 It is designed to shelter the cows during bad weather and allow a man to leave in it for half the year and make cheese. Some of these chalets have huge war dogs but the dog here was nice and chained. I entered the chalet. The armailli was inside. An armailli [ahrmahyee] is the Swiss equivalent of an American cow-boy. like his US brethren, he wears a distinctive clothing, blue pants and a blue jacket called bretzon [bruh-tzon] and often a small cap like people wear at the synagogue. He had a hat instead. These guys come up to the chalet d'alpage with their cows in the Spring and stay up there the whole summer. They come back down in September. 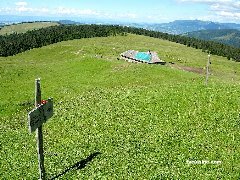 In the Gruyère you will see huge traditional paintings known as poyas [paw-yah] picturing the armailli leading his cow herd up or down the alpage. A very impressive sight when your car gets stuck in the middle of the herd. On a shelf he had the shapes for the tommes. I greeted the armailli, complimented him on his beautiful pasture and healthy cows and asked whether I could buy some cheese. "Sure you can - come on inside", he answered. The man let me into his kitchen, a small place with walls and ceiling black from the heavy smoke of the huge opened fireplace in the back where two gigantic caldrons were hanging. That's were he made his cheese, using the wood for fire. No electricity in these chalets. "where do you get the water from?" I asked. "Water is never a problem. We have four different springs up here. It just streams through.". The caldrons were clearly too heavy for one man to lift and empty outside, and the entire kitchen floor was soaked in whey, which flowed towards the exit and dried. 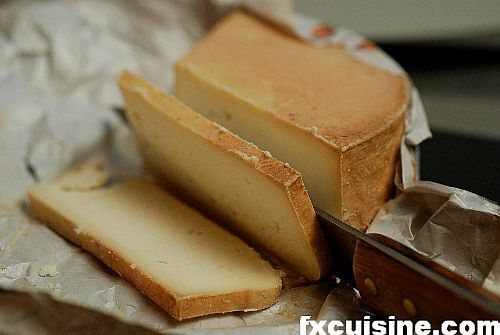 On the table lay the two cheeses he made that day, a goat tomme (front) and a small Gruyère (back). "What sort of cheese do you make?" I asked him. "From time to time I make a Gruyère, but I'm getting fed up with the Gruyère song-and-dance, it's really a tricky cheese to make. This morning I had all sorts of trouble with the acidity level. 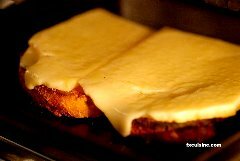 I'll make a Gruyère only if I have time, otherwise I make vacherins. Do you want to taste some?". Of course I did! "Well then, come on in the back.". We moved to an adjoining windowless room with pebbles on the floor. That's where he ages his cheeses. They were on wooden racks. "I rub them in a saline solution twice a day." We were very far from the hospital-clean industrial cheese factories down in the plains. 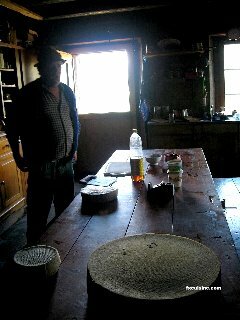 Here at last was the real thing, the single guy in his chalet making and aging his cheese alone on a mountaintop. I tasted all of his cheeses and bought as much as I could afford with the change I had. Very affordable cheese in fact, but if you're short of change the closest bank is about 4 hours away. I must have spent an hour chatting with this guy about his cheese, really a most decent fellow. Some cheeses melt better than others. 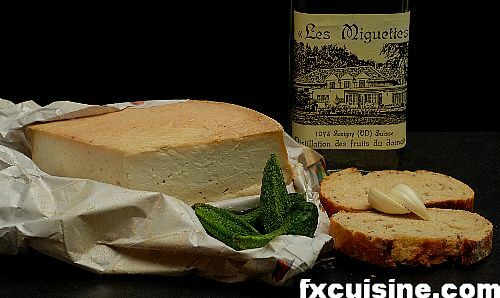 You need a full fat hard cheese, if possible unpasteurized, Swiss and au lait d'alpage , milk of cows who pastured an Alpine meadow rather than some crap in a barrel. There is a world of difference in the resulting product, just like for wine or tea. To make a proper croûte you need your bread to be as dry as possible. 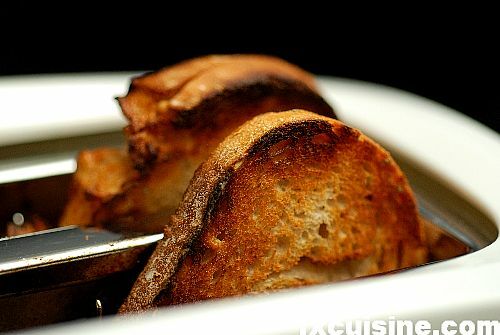 Ideally use stale bread cut into slices and left uncovered for a few days. 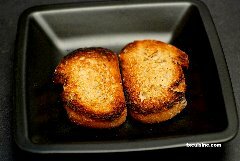 Toast two slices of bread or enough to cover the bottom of the hollow oven-resistant plate you will present each of your guests with. Swiss restaurants routinely toast the bread directly on a live gas flame on their stoves, and they always burn it. 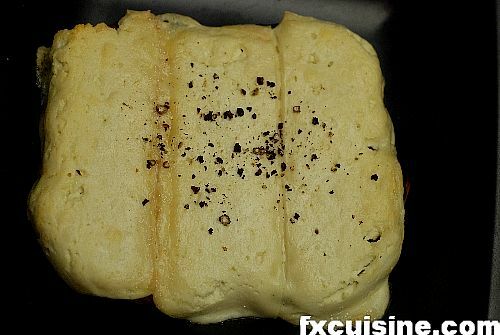 Nobody complains as it is buried under the cheese but the bitter burnt bread taste is perceivable. So toast it but don't burn it. 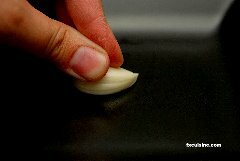 Cut the garlic clove in half lengthwise, remove the inside stem and scrape it against the bread. Garlic lovers will be tempted to put a whole crushed garlic clove into the croûte but the taste will be overwhelming, you won't digest it so well and after an hour or so you'll be left alone in the room. 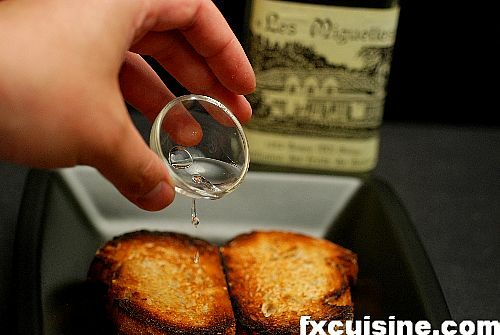 Sprinkle a tablespoon of fruit brandy over the bread slices. There is nowhere you can hide a poor ingredient in such a simple dish. Use the best fruit brandy you have, a distillation of fermented pears, cherries, quince or apples. I used my bottle of President Mobutu's quince brandy which I bought at his house near Lausanne. The right cheese for a successful croûte should melt nicely. 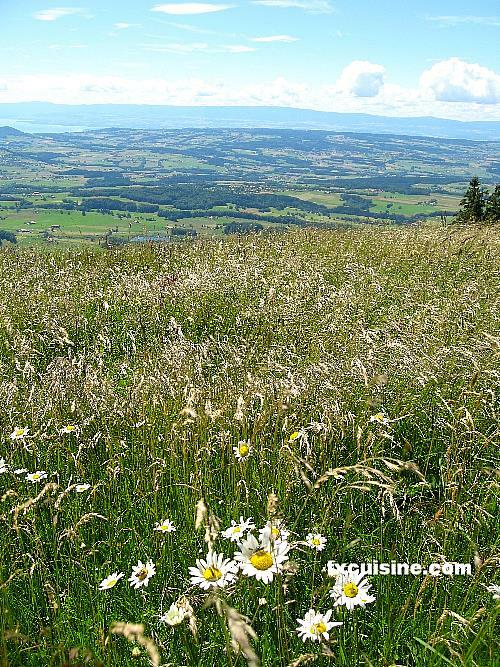 The armailli's Gruyère was just right - not too hard and packing a concentrate of the alpine pasture's grass, herbs and flowers. Cut the cheese in 5mm/0.4'' thick slices and remove the crust. Some people would leave the crust after scraping it but it's good only if you manage to really roast it under a strong broiler, and that is hard to achieve without splitting the cheese into an oily mess. 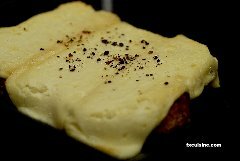 I prepared a second croûte with the Vacherin (picture) although its melting property where not as attractive given its age. Clearly over the hill but you won't find that much taste in any cheese shop even in Switzerland. 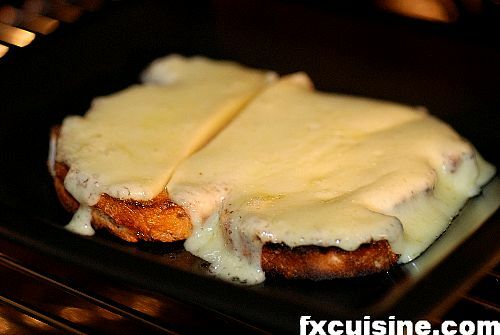 Cover the bread slices with the cheese and melt in a medium hot oven. Too hot or too long and your cheese will split. Watch carefully, it should be ready in about 5 minutes or so. When the cheese is fully melted take it out and don't wait for oily flecks to appear. Serve hot with a little crushed black pepper or powdered white pepper. Do not drink anything but hot tea or white wine with melted cheese or you'll be sick. This applies also to fondue and raclette, two Swiss dishes related to the croûte au fromage. Many people like to eat pickled onions or cucumbers with Swiss cheese dishes. I hope you liked this little trip in the heart of Switzerland's cheese culture and hope you'll have one day a chance to taste real alpine pasture milk cheese - fromage au lait d'alpage! This was a wonderful article, reading and looking at the gorgeous pictures of the swiss countryside makes me want to go there. Unfortunately in the summertime it costs so much to fly to Switzerland and to travel there that I cannot afford it. But reading about it is the next best thing. As someone who grew up on an organic farm, I strongly agree with what you say about the quality of milk being dependent on what the cows eat. This can be said for all animal products, and also of course for vegetables and fruits-if you gas them and cover them with pesticides and wax they aren't going to be very good. Thanks for letting us imagine ourselves in the alpine countryside! 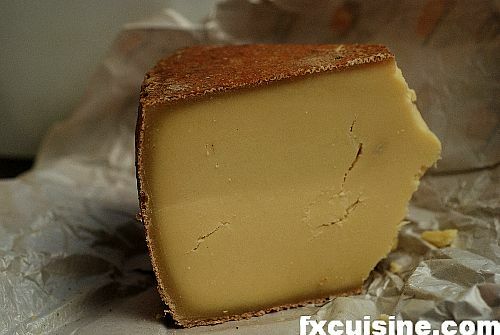 I have been waiting for Francois, as a proud Swiss National, to take us back to the pages of 'Heidi' and here's the cheese that she and Peter may have eaten and children round the world wondered about ( I did at least, when I was 9). Really interesting. Reminds me of Appenzell - the cheese was delicious and it was so much fun to meet the cows in person! Ariun thanks for your visit! I am certain that cheese from Mongolia must have the same wild herbs taste as our Swiss Alpine cheese. 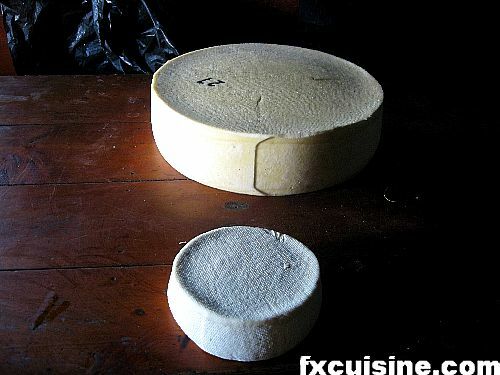 How long to the mature cheeses in Mongolia? I went to the swiss alps on a field trip where we learnt about the cheese making. 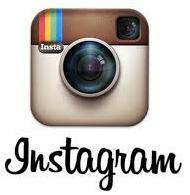 Thank you for reminding us all about it and the beautiful photos! What store sells the alpine cheese? My freezer broke down, and right at the back of the top drawer I found a large, soggy bag of "mélange fondue" that my partner brought back from the Migros in Lausanne last time he visited (which might have been a year ago...). So I thought the perfect way to use this past-its-best cheese would be in a croûte of the kind I used to love eating when I lived in Switzerland. A quick google brought up your site, which I have now bookmarked. Thank you for bringing it all back to me. And congratulations on the fluency and accuracy of your English too - I would never have guessed your mother tongue is French. Jill, I am very happy to see my article helped you to turn a forgotten Swiss culinary souvenir into a dish you could eat. Thanks for the praise on my English, alas it is not all that good but God know I try hard! Thanks so much for a lovely article. I recently came back to the states after living in Geneva for six years. Switzerland is one of the most beautiful countries in the world. Your story made me miss my adopted country very much. I have taken many walks like the one you have so eloquently described here through the Jura and the alps. My wife just came back from Verbier after a week of skiing with the kids. The one request I had was to bring home some of the cheeses I had fallen in love with while we lived there. Last night I made a beautiful fondue and today for lunch I will make the children your croute au fromage. Thanks for bringing me back! Raymond, thanks for your kinds words! I am glad my article could bring back some of your beloved memories of my country. Maybe you'll come back one day? The pastural scenery there is so damn beautiful no wonder the cows are happy! Thuan thanks for visiting, I will be back with better pictures of some scenic Swiss pastures later this year. I truly enjoyed your article. I just returned from Gryon, Switzerland and ate the Croute in a little non-tourist restaurant Passa Nova in Gryon. The Croute was excellent with a regional white wine. 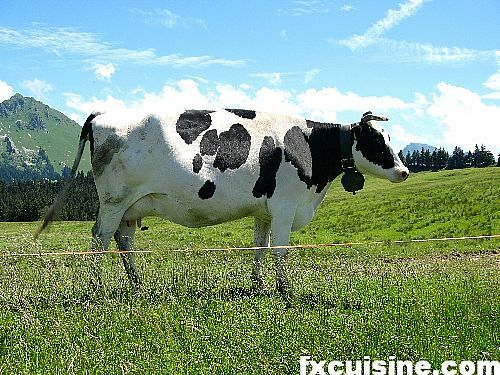 The Swiss mountain cows certainly do produce the finest milk! 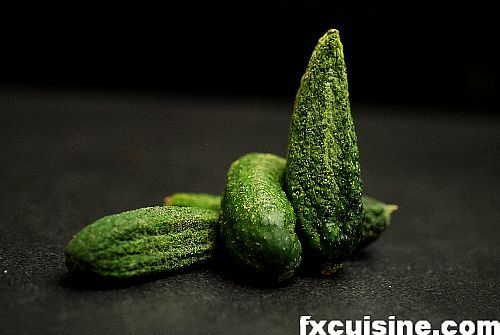 Joanie, the croûte you had in the restaurant is probably nothing compared to the one you can prepare right in your kitchen with the cheese you have probably bought in Switzerland! English is not spoken but if you are friendly and smiling you'll get a good welcome. Just point at the cheese and wave a banknote if you must, and you'll get to buy some. 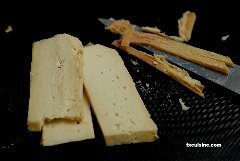 Please read my other cheesemaking articles for more chalets like this. The season is now over, they bring the cows up from July to September, weather permitting. Having endured the beautiful portraits; both written and visual, I now understand why my Sister in Law has been residing in Lucerne for many years. The beauty of the country, the charm of the smaller or older cities is quite taking. My experiments in haute cuisine have been enhanced by your pieces....carry-on and of course, without any doubt - Bon Appetite! FX's answer→ Jay thanks for visiting and glad you liked the article! Francois - Enjoy the articles and want to express admiration and thanks for the very good accompanying photographs. They really bring to life your words, and often make me hungry for the food in the article. FX's answer→ WC thanks and glad you like it! "Someday,to own a chalet", when asked about my dream. Some years ago,my sister and my parents took a "Whirlwind trip of Europe",a three weeks tour that took us to Switzerland.Unfortunately,I was not able to buy my dream chalet. commented to the tour guide that the place is so quiet. no problems,that's why they are so serious and don't smile." FX can you tell me more about your people? We learn in school that your country is a peace loving nation,the home of the Red Cross.Tell me that the tour guide was wrong. and after 24 years one of my precious possession is still a gold charm bracelet bought in Bucherer with a replica of a Swiss chalet. Thanks again for your incredible site. FX's answer→ Thanks Melit, for sharing those beloved reminiscences of my country! Yes we are such a small nation that we don't care for wars or trying to influence other countries' affairs. And when a part of Switzerland wants independence, we have a procedure in our constitution to make a new canton so that they can rule their own affairs, so there is very few regional resentment like you find in many great nations across the world. 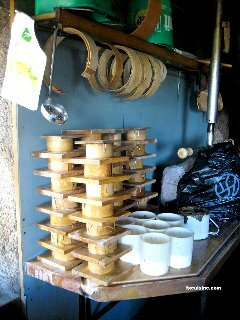 This is just the sort of cheesemaking set up I'd love to have!! Pastures and all. Perhaps someday!! Merci beaucoup. Great recipe and memories of Verbier.